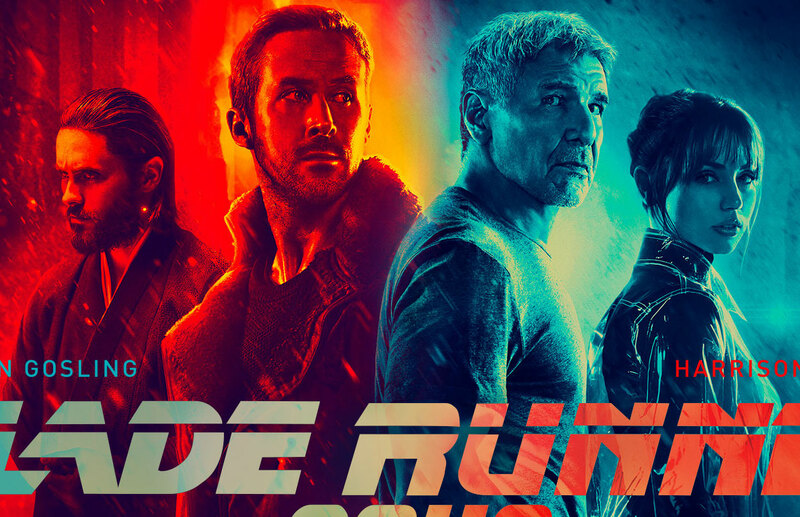 'Blade Runner: 2049' review: the real deal and that includes the Replicants – AiPT! ‘Blade Runner: 2049’ is everything you’d want from a science fiction film and more. There’s no doubt Blade Runner inspired a generation of filmmaking and still does today. That made science fiction fans take an extra heavy gasp when a sequel was said to be in production. How could the holy grail of nihilistic, visually striking, above and beyond its time science fiction genius ever have a sequel that wasn’t a complete letdown? Like the police cars of the future, however, the sequel lifted the first up and kept on going over our negative worries like the cold dead dirty city Harrison Ford flew over 35 years ago. Good science fiction does one of two things: first of which is delivering thought-provoking commentary on society or life in general and the second that it visually stuns and entertains. Blade Runner: 2049 does both. It’s not often I leave a film pondering its complexities, reflecting on the visuals, and running through my mind what it all means, but this film did that and more. It’s the sort of film that can be entertaining to those who want a visual feast but don’t necessarily care about the bigger meaning too, which makes this a huge crowd pleaser and a film I anticipate making a lot of money. It ticks off so many boxes it’s sure to make fans of a variety of genres happy. That all starts with Harrison Ford, who comes back (as the trailers spoiled) as Decker. I’ll say no more to avoid spoilers, but let’s just say this film adds to his story, but can also be enjoyed without it. All of the basic details you’d need are adequately relayed in this film and done so in logical non-obtrusive ways. When a film can give good exposition via story or action it’s doing its job right. That’s in part due to the film being a visual story first, which director Denis Villeneuve understands completely. The first film is sometimes criticised for the long shots which allowed the soundtrack to play its droning yet eloquent music and this film has them, but typically to help progress the story. The visual element is key for the series of course, but this film also takes some big risks too. More than once I marveled at how they captured the isolation and chaos of the first film, but in different ways — from a “farm” of infinite plastic covered tents that is cold and impossibly large to the simplicity of rooms and vehicles, to remnants of San Diego that’s mostly endless trash and refuse. There are outdoor scenes that convey the nihilism of the universe and indoor scenes that look much more futuristic than the first, yet still manage to imbue a sense of isolationism. The designer of the world and vehicles Syd Mead, who also supplied some designs for this film, should be quite happy with how this film came out. His aesthetic is obviously not lost in the dark cityscape shots but can be seen throughout (though in some ways more advanced). Given this film takes place over 30 years after the first, that makes some sense. You can see it with vehicles in particular which are more rounded than what he would have ever envisioned. The film always seems to have a new or different visual element be it a hologram, environment, or even the clothing. Blade Runner: 2049 looks like it was given all the polish from all the departments and it shows. The story is fantastic too. Part of the reason so many fans loved the original was that it told a visually striking story, but it also had a deeper meaning about what it means to be human. After recently watching the original (the 2007 cut) I think it’s safe to say this sequel surpasses the first but for obvious reasons it’s due to the unique and groundbreaking nature of the first. Blade Runner set up the idea that the Replicants, AKA lifelike robots, don’t want to be slaves or even die. They want to live on, just like humans do, and doesn’t that make their lives worth something? This film takes that even further, exploring different forms of artificial life like sentient holograms and artificial environments. There’s an even deeper dive into artificial life and their purpose, which is explored on multiple levels, but I’ll steer clear of that to avoid spoiling this richly contemplative experience. Ryan Gosling takes these ideas further by acting with a coldness, but also an awareness that’s deeply real. There isn’t a performance that was underwhelming, but Gosling truly gives the film a deeper meaning and stands out among all the other characters. Some say an actor can imbue a deeper sense of self and presence with just a stare and I think Gosling may have perfected it while making this movie. Harrison Ford is also great and he brings the gusto and gruff we know well from the actor. Jared Leto, who is incredible in nearly any role, plays a good villain and this time it’s via a subdued and sadistic Niander Wallace. Given how little time many of the characters have on screen including Leto and Ford it’s a testament to their acting that the characters come off so complex. The film also lays some groundwork for something to come after. Any good film tends to have an open ending so as to allow the viewer to take the story further, or at least allow them to reflect on where it may go from here. It’s not an overbearing thread to go on, but it gives viewers an idea of a possible follow up to explore the world further. I was blown away by this film because its identity is never in question. There’s a certainty with the visual style, character arcs, and story, that are so sure of themselves you’re instantly taken with them and never pulled out of the experience. In this day and age of schlocky blockbusters and gimmick laden sequels and series it’s nice to see a film that’s technically a sequel do everything so right. This is an excellent film that could easily be watched more than once and you'd still gather insight and entertainment.